A compact USB MIDI keyboard controller for the musician on the move, but with full-size keys and polyphonic aftertouch too! 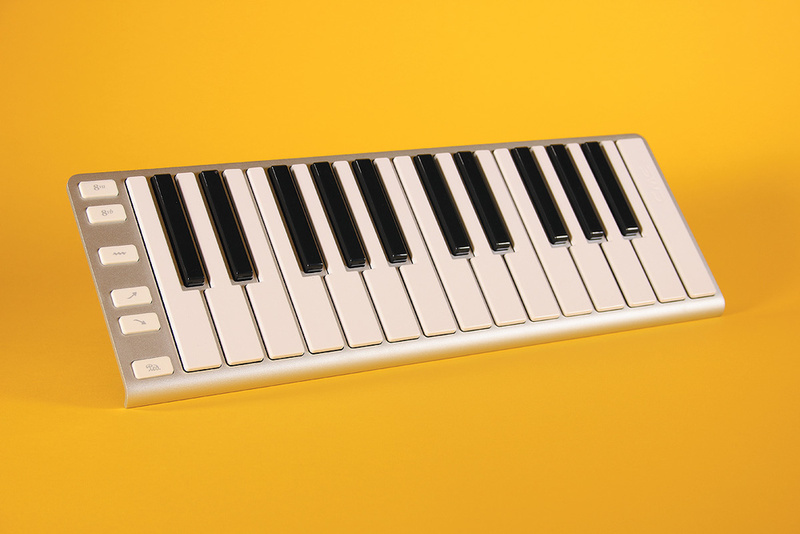 Finding a keyboard for a mobile music-making rig is all about compromise — if you want something very small and portable, you generally can’t have full-sized keys and will have to be prepared to dispense with some facilities. CME’s Xkey rather bucks the trend, however, in being possibly the thinnest and lightest controller keyboard on the market, while still managing to offer 25 near full-sized keys (the black keys are narrow), and offering polyphonic aftertouch (key-pressure messages) as well. The elegant, low-profile aluminium housing has the clean lines of the current Apple computer keyboard range; a comparison that is further echoed in the keys themselves once you realise that the entire key moves down regardless of where it is pressed along its length. This significantly changes the feel from a normal pivoted key, but is probably easier to adapt to than small keys with the wrong spacing, or squishy pressure pads. The entire travel length of the low-profile keys, however, is only 3mm or so, and although the Xkey supports the full 128-step MIDI velocity scale, it is not easy to be expressively precise in exploiting it. Unsurprisingly, it’s a similar picture with the poly aftertouch: it certainly works, but there is a limit to the amount of worthwhile sonic nuance you can control in 3mm of pressure variation. And yet, notwithstanding the above, I actually really like the Xkey! It feels very robust compared to many lightweight ‘mobile’ keyboards, it is conveniently USB class compliant and bus powered and is supported by a decent app (Xkey Plus) that lets you update firmware and adjust most of the significant performance parameters. The keyboard also consumes very little power, helping your laptop or tablet battery last that bit longer. The Xkey’s compact dimensions — it measures just 388 x 135 x 16 mm — have been achieved in part by dispensing with conventional controls for pitch-bend and modulation, which are both dealt with via pressure-sensitive pads. They are not especially precise in operation, but are by no means unusable. I can see from the data that they are actually very high-resolution controls, it’s just that, once again, there is a practical limit to how much precision the performer can bring to bear in operating a pressure sensor with minimal travel. Octave switching and sustain are handled with matching switch styles, with the latter falling conveniently under the right-hand little finger without too much of a stretch and much easier to get used to than I imagined. The upside of the limited key travel is that the keyboard is physically incredibly easy to play on, especially for beginners or anyone not already used to full-travel keys. How it ‘feels’ in musical use is very much dependent on how the software instrument it is driving responds to velocity: anything that changes too dramatically with small variations in velocity tends to leave you feeling a little out of control, but voices that exhibit a larger window of ‘normality’ over a wide range of their velocity scale are all comfortably playable. The Xkey Plus app allows you to not only scale the data sent by the keyboard but also to change the type of MIDI message sent by individual keys and controls. You can also set global parameters, including disabling the poly aftertouch, and upgrade the firmware (my tests were performed with v1.3). Configuration data is stored in non-volatile memory, so changes made via the app are retained by the Xkey after disconnection. I think of the Xkey as more than just a mobile solution; its compact dimensions and slick functionality make it an ideal studio keyboard, too. Even if you have a main keyboard that you’ll always choose for serious playing, the Xkey is small enough to be kept always sitting right in front of you for easy data entry for step writing or editing. And for the many for whom keyboards are only a very occasional instrument used for minor supporting parts, it’s great to have the option of something that takes up so little of your working space whilst still offering good functionality. Whatever your particular use might be — programming ‘finger drums’, occasional keyboard parts, or music-making on the move — CME’s Xkey offers a very elegant and affordable solution. There’s really no equivalent that I can identify as a direct competitor amongst the numerous compact mobile keyboard controllers on the market; they all offer slightly different things. In this sector, it really is a case of choose your compromise on the basis of your personal usage priorities. Upgradable and adjustable via the supporting app. Easy to carry or keep handy in the studio. Short travel of keys and controllers limits performance expressiveness. One of the nicest compact controller keyboards I’ve tried. Very usable and versatile unless you need keys with a more conventional action.